Crap. 8 minutes to go, and we were looking good. 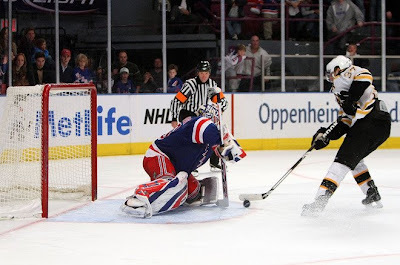 Lundqvist was playing well again - I didn't realize just how good he was until I saw him play in person last night. There's a reason they call him "King Henry," and it's not his appreciation for shakespeare. It'll be fun when he comes to the Gahden. Talkative folks who will let you respond, and talkative folks that won't. And that one guy who thought it was important enough not to aim so he could jaw at me in the bathroom. Whatever. Roszival is hated enough at MSG that they boo him when he touches the puck. It's really weird. I bet he likes away games. NYR goes up 5-1 in shots, Kobasew fights Mara, and then the period ends, 11-6 in shots. Lundqvist makes some sick stops, so does Thomas. Very back-and-forth play. Not much happened. We move it around a bit, still nothing. This game will end 0-0 SO. BUT WAIT! Lucic forechecks in the corner, Bruins move it around off Lundqvist, bounces out to Chara, who blasts one through. Goal. Chara takes a hooking penalty. 30 seconds in, Wideman strikes. Short-Handed Goal. 2-0. "King" henrik isn't looking so good now. the 2 goals allowed are against defensemen. The rest of the second is me jawing with the guy behind me. Whatever. Third period is painful. I enter it worried. 10 minutes in, it looks like I'm just over-worrying. 6:05 to go. Nigel Dawes buries it. Bruins keep playing solid, but are giving up too many shots. Timmy's an all-star caliber player, but if he is an inch out of position and they're just shelling him, one is bound to go in. We're down to one minute to go. Lundqvist goes running for the bench. Markus Naslund takes a pass from Vancouver and the building explodes with 53 seconds to go. Little more skating around, OT time. Bruins won't be gaining as much on the trip as I'd hoped. 5 minutes of 4-on-4 and we're back exactly where we don't want to be. Crap. Ok, who does Julien send out? Oh, ok. Bergeron. Let's see how that goes. Final score 2-2 SO LOSS. Shorthander by Wideman! Big Money Wides is earning it. Chara with the first goal is pretty huge, too. We let this one get away from us. The game isn't over until it's over, as we learned here. Taking points away from other arenas is a good thing. We've been too busy playing the northwest and the original six to play many atlantic teams. Currently, we've lost both games against the atlantic division in the shootout. Vomit. Bruins PK has significantly improved. We went 6-for-6 last night, bringing the season average to over 80%. Bruins have improved from last in the league to 19th in the league. If we played solid D through the end of 60 minutes, rather than 50, I'd be writing a hahahaha road win blog last night from my friend's couch rather than a more sober crap one from the bus. Big ups to the Bolt Bus for the wifi.